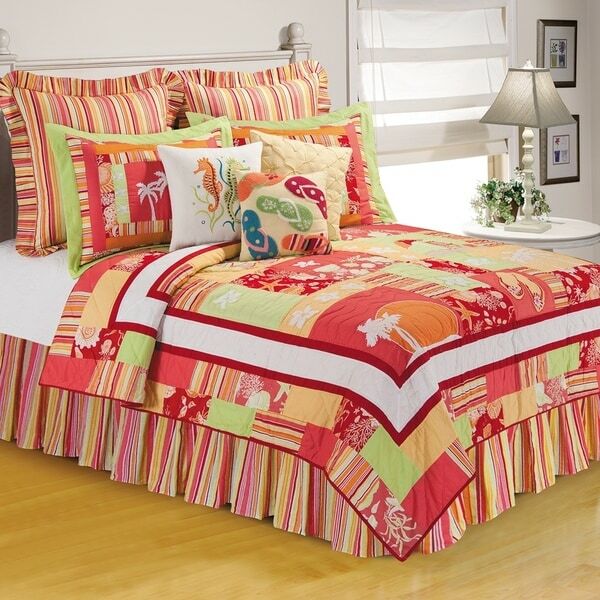 Like a burst of tropical sunshine, the Tropical Paradise Quilt utilizes a warm color palette comprised of pinks, reds, orange, and green to evoke the feeling that comes from watching the sun set over tropical waters. Embellished with a variety of motifs including shells, palm trees, flip flops, and tropical flowers, this is the perfect bedding option for your coastal home or beach cottage! Crafted of 100-percent cotton with polyfill for loftiness and machine washable for easy care. Pair with our crisp White Shell Matelasse Euro Shams and White Tailored bed skirt to finish off your coastal styled room. Dimensions 86.0 In. X 64.0 In. X 0.5 In.